Opening a dispensary can be a daunting task. With everything from licensing, to location, to product there is a lot to consider and focus on to ensure a successful launch. One of the most important things that often gets overlooked when opening your first dispensary is marketing. Although the trademarks for your logo and color palette, as well as your website build out are easy to remember, what is sometimes forgotten is how your new shiny dispensary will attract patients and customers once the doors are open. 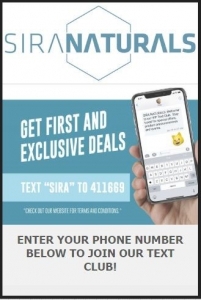 Recently, Sprout had the opportunity to work with a local dispensary, Sira Naturals. They were starting from scratch and were looking to secure a solid base of customers quickly and turned to Sprout for that assistance. By utilizing the Sprout CRM & Marketing Platform, establishing a keyword, ‘SIRA’, within their advertising and asking those who were interested in learning more about the opening to text ‘SIRA’ to 411669, they began to build a customer database even prior to their opening. This information is then stored in the same CRM database provided by the Sprout platform. The more patients/clients visited the Sira dispensary, the more the Sira contact database grew. As they continued utilizing services like mobile coupons, mobile surveys and different promotional outreach with Sprout, more and more visitors came to their dispensary each day. After just 3-months on the program, Sira’s customer database had grown to over 6,000 patients. Even more so, each time they would send out an offer or promotion, the redemption on these offers was as high as 30%. So, for every 1,000 people they would send a promotion or coupon to, 300 people would show up at the dispensary and act on the particular promotion offered. Sending a promotion or offer at minimum once a week and sometimes twice a week has been extremely successful for Sira to this point. As with each outreach, comes added traffic and more opportunities to interact with the customer base and build the brand loyalty and trust all locations and owners strive for. marketing and additionally share marketing responsibilities with several folks within their new dispensary. When Sprout asked the question of how many patient/customers they had up to this point, the answer was shocking. Only 700 folks had been captured in their system to that point. A significant difference when compared to the same time frame and the success realized by Sira. By utilizing the Sprout platform weeks leading up to your dispensary opening, you can establish a head start and some excitement for your opening. Sending offers for VIP Text Club access, free giveaways and special promotions in the days/weeks ahead of your launch has shown to ensure early rewards and tilt the scales in favor of your future success. To learn more about how Sprout can help you with your upcoming launch, email us at hello@sprout.online or text SPROUT to 411669 and a Sprout Launch Representative can talk through a custom solution for your successful opening.